With similar passion for protecting Oregon’s “great birthright,” in 2003, Nestucca Spit Press published Grasping Wastrels vs. 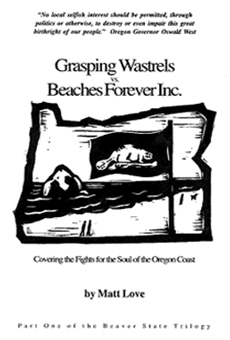 Beaches Forever Inc.: Covering the Fights for the Soul of the Oregon Coast, a collection of essays by Matt Love and Part One of his Beaver State Trilogy. In the collection, Love takes a provocative and participatory approach when investigating some of the lost, ignored or forgotten stories about preserving the Oregon Coast. Among the essays are: the untold history of the state’s famed 1967 Beach Bill, a thank you to Bob Straub for his heroic victory over a proposed beach highway, how a hippie couple defeated a coastal nuclear power plant, a reflection on the Bayocean resort debacle, accounts of the botched opportunities to preserve undeveloped coastal property, and the uncovering of the failed attempt to establish a national park on the South Oregon Coast. The 98-page book also includes photographs, a bibliography and four bonus essays stored in a library pocket inside the back cover.